Hand crafted paper mache flowers, yummy sugar skulls, and numerous altars of deceased celebrities adorned Covel Grand Horizon on The Hill Sunday, October 30th. The event was in celebration of Dia de los Muertos. Organized by the Chicano/a residential floor, they showcased student artwork and hosted live entertainment with their overall theme of Day of the Dead. According to Catholic beliefs, Dia de los Muertos kicks off the month of November that is dedicated to the souls of purgatory where believers pray for their dead. Dia de los Muertos is influenced by Mexican indigenous culture and Spanish Catholicism. The holiday is observed on November 2nd and it provides an opportunity for family and friends to honor and commemorate their deceased loved ones. The holiday is not one marked by sadness but is filled with joy as people remember their loved ones with music and food. Families often remember their dead by setting up altars with offerings of the dead’s favorite objects. People celebrate by making sugar skulls and decorating graves with colorful flowers and by spending time with their deceased loved ones. Despite being held early, the Dia de los Muertos on event on the Hill, was a complete success. Attendees had the option of making sugar skulls, paper-mache flowers, or just sitting down and enjoying pan de muerto. 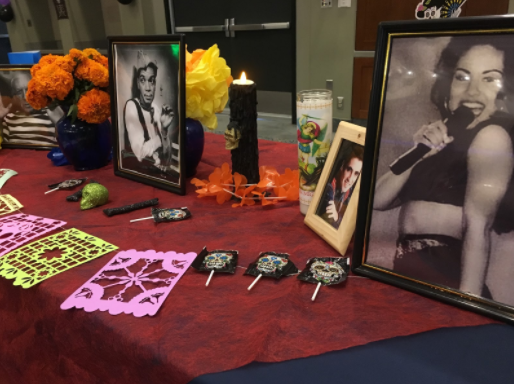 There were also altars of deceased celebrities, such as singer Selena Quintanilla-Perez and actor Cantinflas, and paintings related to el Dia de los Muertos for people to admire. Additionally, there was was a Day of the Dead themed photo booth for people to have their pictures taken. This gave many the opportunity to model the festive face paint offered at the event. After an hour, UCLA’s Grupo Folklorico took the stage and performed for 30 minutes. They danced beautifully to traditional Mexican songs. Mariachi de Uclatlan followed Grupo Folklorico. They filled the room with their vibrant music and wooed the audience. The event created a sense of community on the Hill and welcomed students to celebrate their loved ones while learning about Dia de los Muertos.